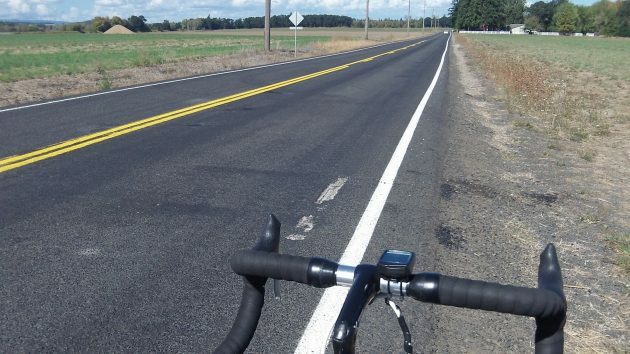 Another bike-related update: We’ll have to wait at least another year before Benton County restores the wide shoulders that disappeared from a section of Independence Highway last year. And yes, it does matter to everybody on the road. The stretch of Independence from Camp Adair Road to Spring Hill Drive was chip-sealed last year. When the paint crew applied a new fog line, they inadvertently eliminated what had been intentionally wider-than-normal shoulders. The county said last year they’d fix that when applying new paint this year. But as I confirmed this week, it didn’t happen. You can see where the old fog line is peeking through on Independence Highway. A group of us were talking the other day and the question came up, what if there were a bicycle license, like an auto license, and a tire/tube tax to fund bicycle road needs? In his nonstop effort to shield bicyclists from any and all financial responsibility, Mr. Hering relegates the concept of a bike license as “interesting but impractical,” without indicating why it might be so. While it may be equally “interesting” or similarly “impractical,” the state somehow manages to collect “user fees” in the form of licensing monies and gasoline taxes on motorized vehicles. By performing this “interesting but impractical” function, the state helps all citizens of the state who use the roads, including those who pedal. Perhaps Mr. Hering’s concern arises from the thought that bicyclists might actually have to contribute to the maintenance and upkeep of our common roadways through a bike license fee. Hering’s reticence to pay for what he uses demonstrates an attitude common amongst persons of his persuasion – namely that they want the privileges society offers, but they believe their existence alone is reason enough for their entitlement and see no need to support societal improvements – in this case a wider path for bicyclists. Yet one more crystalline example of White Male Privilege. Gasoline taxes are collected at the distributor level, which is basically that large tank farm in Portland. License etc. fees are collected at the DMV, providing STATE JOBS. When bicycle paths exclude pedestrians, you might have a minor point. CYCLISTS take the “heat” over cost, while pedestrians get a free pass. Doesn’t your “Party of Tolerance” encourage less gasoline use and encourage low emission activities like cycling? You are humorous to read. Lots of fodder to point out your hypocrisy. It’ll be interesting to see how many bizarre personalities you possess. The universe operates hypocritically. I don’t believe everything I think. Everyone seems to be missing the simple fact that bicycles and pedestrians produce virtually no wear on facilities. The wear comes from thing like freeze-dry cycles and the significant weight requirements of motorized vehicles. There is also the fact that virtually everyone uses motorized vehicles all the time anyway, whether cars or buses.They are paying the same as everybody. The argument basically comes down to those folks, that apparently have never walked or bicycled anywhere at all at any time in their in their lives, object to have anything at all spent of gas taxes on walking/bike paths, or even pedestrians and bicyclists using their precious roadways. What do you call people who think like that? Conservatives are the ones that actually paid for their bicycles. Alas, being a “non-pedaler”, how’s this for a silly idea? Each day a long section of highway would be blocked off from “traffic” to allow only the bicyclists to have immense shoulders to ride on!! Hey, in the Albany D-H is a flyer to walk/ride the new Eddyville section this coming Saturday!!! TERRIFIC idea! And, what does bicycling have to do with my supposed White Male Privilege you cite Mr Cauter?? Unfortunately, the weather forecast for Oct. 1 is bad.